The Space Shuttle program was formerly titled the Space Transportation System (STS). The STS began operations in 1981. 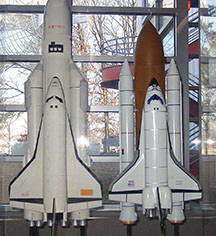 The first shuttle was named ENTERPRISE after NASA agreed with an outpouring of Star Trek fans. The Enterprise was initial designed to be a operational space vehicle but after design changes it was too costly to retrofit. The Space Shuttle was created to construct the biggest platform in our orbit - the International Space Station (ISS). Our first shuttle flight was STS-1 with shuttle Columbia on April 12, 1981. Shuttle flights continued until STS-51L when we lost the crew of shuttle Challenger (Ellison Onizuka, Christa McAuliff, Gregory Javis, Judith Resnik, Michael Smith, Francis Scobee and Ronald McNair) just 73 seconds after liftoff on January 28, 1986 . By the mid 1980's U.S. intelligence sources discovered that the Soviets were busy constructing a heavy rocket and their own version of the space shuttle. Unlike our shuttle with powerful main engines the Soviets had two smaller less powerful engines mostly for orbital and low-atmosphere operation. However the Soviet version lacking those main engines gave them a larger payload section. By the late 1980's we had learned the Soviets had three shuttles and when the "iron curtain" fell we knew they had five. Also discovered was that the Soviets were working on a space plane that could skip in and out of the atmosphere and homed at their to be expanded MIR space station. By the year 2000 the Soviets had every intent of having 100 men housed in orbit. On February 1, 2003 I turned on the TV to watch the landing approach of STS-107 shuttle Columbia - I immediatly called my wife into the room seeing what could only be the shuttle fragmenting into fireballs. We lost seven more that day (David Brown, Laurel Clark, Michael Anderson, Ilan Ramon, Rick Husband, Kalpana Chawla and William McCool). No further incidents took place by the time the last mission STS-135 of shuttle Atlantis landed on July 21, 2011 , fourty-four years and one day after we landed on the moon . New Shuttle safety procedures and shuttle modification were made delaying further launches until the STS-26 mission with shuttle Discovery on September 29, 1988 .